If there is one person I pay particular attention to online, it’s James Altucher. For that I thank, Mr. Srinivas Rao. Okay I admit, I’m a fanboy, but I can’t help it. I agree with just about everything he writes, plus he’s authentic, creative and inspirational. He writes about Choosing Yourself quite often, and I’m 100% on board. Ever heard of Eric Ries? His “overnight” success was all about NOT pretending. And it looks like Matthew Berry has created a pretty amazing career by choosing himself and not pretending. Okay, I’ve written a few of my own “10 best …” posts, but I like a mix, which means I love to bang out a personal post or two when inspiration whacks me in the old noodle. So, what does this have to do with business? Branding? Blogging? The “stuff” I often write about? Take it from me kids, I’m a guy in his late forties. I’m still dreaming and working to turn those dreams to action, daily. So, if you’re 30 or 40 or 60, please don’t stop dreaming. Well you know how I feel about this. Steven Pressfield’s The “War of Art” is one of my all-time favorite “self help” books. It’s all about not giving up. You might be clever, resourceful and have a noggin filled to the brim with brilliant ideas … but without dogged determination you’ll get nowhere. I increasingly want to work with businesses with this mindset. I love what I do. I just want to change things up a wee bit. In fact my blog will increasingly be about new services I’ll be offering to the small- to medium-sized businesses I work with: Design and branding with all the content marketing goodness I can dish out. I know, content marketing is a crappy word, but we’re stuck with it and I’ve jumped on the content marketing bandwagon. I’ll just add my own twist, and I’ll continue to be real. Please slap me silly if I stop. I believe business can blog with a combination of usefulness and more than an ounce of passion to tell their story. Yes, even professional services firms. And trust me, my portfolio will start to reflect that. I also realize that old push media is dying on the vine and I would be doing clients and potential clients a HUGE disservice if I didn’t jump on the content marketing soap box. There’s a “Pool Guy” who consistently inspires me to bust a move in this area. I am. And at the same time I’m working to build something else. It’s about breaking out, late bloomers and making big things happen. In fact I might be harassing Mr. Altucher for an interview in several months. We’ll see if he wants to talk to this rube in Seattle. So what can diversifying do for you? Start lean, be agile, be persistent and do not give up. Bootstrap … and make things work your way. Be incredibly useful (I’m working on it) but try and have some fun, K? This is where we get to my favorite quote from the post about hushing up, being perfect and all that stuff. Yes, I know, nobody is 100% authentic online, but revealing an ounce of truth won’t hurt. It might even generate a few ripples that result in the most colossal tidal wave ever. Mr. Altucher and Mr. Sheridan have done this … in very different ways, of course. For that, I salute them. An added benefit of honesty? We all like to vent, and that’s good for the soul. So today, get your Altucher on … Choose Yourself! I’m changing-up my business, I’m working on a passion project and I’m still having fun, despite the craziness of life I like to ramble on about. Is there anyone online you agree with most all the time? How good are they for your soul? Don’t you think the qualities above are essential for happiness, productivity and a successful entrepreneurial venture? Honesty is the hardest part for most people, that and facing their fears. I think it all comes down to feeling like you’re not good enough. Our culture is so stuck in the fake it till you make it track and on the goal that we seldom understand the process is as important as the end result. Until you can own yourself, you’ll never own the media, the content, or the business. Good post, Craig, and thanks for turning me onto James. I think so, and if you are blogging for business it can get a bit tricky, but like I wrote, nobody is 100% authentic online, yet revealing an ounce of truth sure won’t hurt. If you can do this and be incredibly useful. Well, that’s an unbeatable combination, huh? Read the Altucher post. Read this one. Love them both. Time to up my online honesty percentage. Thank you, Sir! Sounds like a plan. I am also a James Altucher fan and agree with him most of the time. His posts are incredibly entertaining and honest. I don’t find it hard to be honest, so I really try to be very personal in my writing. I’m also a Craig McBreen fan! Love your style as well. Thanks for the kind words, Sheila. Nothing wrong with showing a bit of yourself to the world, eh? 🙂 Have a great weekend! 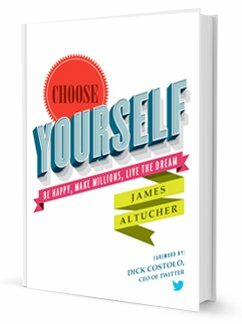 Mark Harai introduced me to James Altucher’s work. I was hooked immediately. I love his honesty. I love that he talks about challenges. That’s what I love about Mark Harai, Jim Connolly and your work. I especially appreciate that all of you talk about the reality of business – the joy, passion and fulfillment AND the challenges, failure and fear. But none of you are negative. There’s no bashing. I have no time for bashing. It takes, it doesn’t add. One of the biggest barriers I had to overcome before I stepped into using social media and actively learning about content marketing was the fact that the learning curve so very, very public. I’m an educator. For more than 30 years, I’ve been doing my learning in public but these media stopped me cold. My perception was that I had to be perfect and I know that I’m not. I am so grateful for the teaching and mentoring I’ve received from you, Mark, Jim and the other solid people I read regularly. I’m very excited to see how your world evolves! Well, I’m a Mark Harai fan myself. I’ve read Jim’s blog, but man it’s been awhile, I need to check back and see what he is up to. Ah, yes, the reality of business … and blogging 😉 I don’t like bashing, I see so much of it in the online space and frankly it’s just not the way I like to operate. But, thank you. Yes, you are kind of exposed, but showing that imperfection is often what resonates … we all make mistakes, we all learn as we go to a certain extent, and we are all fallible beings. I just say keep pushing and let the world know what you are doing. I don’t mean fake it til ya make it, offer up your expertise, but admit that there are a few things you don’t know … nothing at all wrong with that. Thanks for the nice comments, Sharon! I’m happy for the growth you’re going through dude. I love the work you do and I can’t wait to see what comes out on the other end. …and I’m right there with you. Every day many of these same influencers are helping me find myself. It’s work… work… work. Thank you, and I certainly feel the same way about what you’re doing … very impressive. Hi Craig! It’s been a while! I apologize for having been absent for so long. It’s been a crazy year and someday I’ll have to tell you about it! BUT it absolutely goes along with your post. The rough times, the REAL times, are where all the stories are. It’s in THOSE STORIES we are able to connect with people. THAT is where fan bases come from. That is where friendships are born. THAT is where people live. So why is it so hard for businesses on and offline to do? Bryan Thompson recently posted..Your Story Is NOT Your Legacy…And Legacies are a BEAST! Thanks, it has been a while. No need to apologize, just glad you decided to stop in! Well now, I am very, very curious. You are very welcome and I am certainly looking forward to what you have in store for us, Sir! Catching up on some of my reading and ran across this post. I also love James Altucher’s honesty and authenticity. I won’t claim that I’m yet able to take the mask off entirely. I’m still trying to figure out how to do that in a way that let’s me speak freely, yet lets me keep my options open for a while. The shift is on, though, toward full transparency because I’m tired of playing the game–which always leads to someone else’s success, rather than my own. I’m not looking for a giant pie, just a nice, fair slice. And I do believe there’s infinite “pie” and we can all share in it. Taking the mask off isn’t easy for everyone. Years ago I wouldn’t even have considered social media or blogging, but glad I did. I think honesty is great and I’m drawn to bloggers, such as Altucher, who do this. And I’m currently planning another site which will be a heck of a lot more revealing than this one too. Really looking forward to that. Anyway, if you have a certain tingling in your spine when you’re ready to hit publish … well, that’s a pretty good sign. The trick is writing like this without being too negative or self-absorbed, which often turns people off. Best of luck to you and I wish you much success.